Ecosystem Marketplace tracks a spectrum of investment and compensation mechanisms for natural infrastructure for water. Investments in watershed health are the largest category of payments for ecosystem services by transaction values globally. 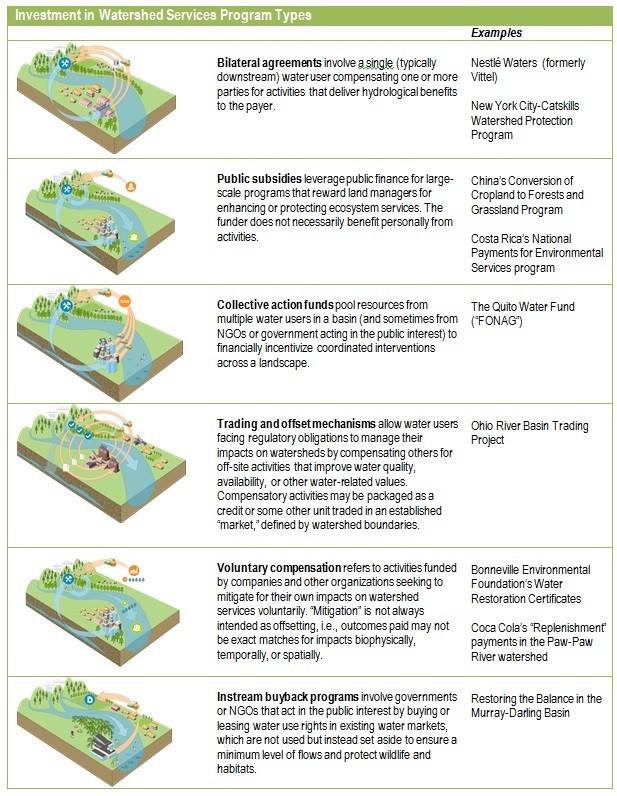 These mechanisms range from simple contracts between a buyer and seller to deliver cleaner or more reliable water to sophisticated markets for trading water quality credits or water rights that restore instream water levels (see Program Types below). All investment mechanisms originate with a utility, government, business, or other party that attaches value to a watershed service or set of services and agrees to compensate providers of that service accordingly. For example, a beverage company might be willing to pay local farmers $100,000 per year to reduce pesticide use, when treatment of polluted water would otherwise cost $150,000 per year. In this scenario, an individual farmer might be willing to curtail their pesticide use for $3,000 per year, assuming that this amount would cover their costs to switch to organic methods or otherwise compensate them for foregone income. This is only one example – in practice, the nature of investments varies according to the buyer’s specific goals and the general context. One business may decide to partner directly with landholders located near its water source, while another may prefer to contribute to a public watershed restoration fund that handles the management decisions. For example, a single entity with a very clear watershed service need may gravitate toward a bilateral arrangement. Other program types require fairly sophisticated regulatory frameworks and institutional capacity (such as trading and offsets) or a certain type of property rights regime for water (such as instream buybacks).